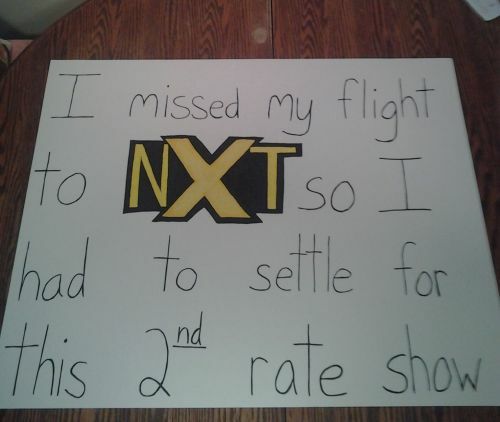 An epic troll by a fan who missed out on WWE NXT and had to watch RAW! WWE is nothing without its fans, the so-called WWE Universe. It is the presence of die-hard WWE fans which has made Vince McMahon’s promotion so famous that it is. Wherever on the planet a WWE show takes place, the fans make sure that the arena fills up to its maximum capacity and they give the fans watching at home a memorable event. The fans in attendance play a big role in the experience the TV audience has. Their enthusiasm and craziness create unforgettable moments. It is often uninteresting to watch a WWE show on TV with a dead crowd in the arena/stadium. The importance of the spectators cannot be measured and some of these spectators come up with banners and placards for their favorite superstars. If they are lucky, they get captured by the broadcaster and they are on TV. But, not all fans come up with constructive messages on the banner, some use their unique creativity and bring humorous banners to the stadium. On one of the RAW episodes, a member of the WWE Universe looked to be extremely miserable with the pathetic quality of the RAW episode he paid to attend live. He revealed his disenchantment straight away with a banner reading, “I could be at home watching Nitro”. Seriously, during the Nikki Bella vs Brie Bella feud, the quality of the episodes of the flagship show were not up to the mark and hence, any fan might have wished to watch Nitro episodes on the WWE Network.